A table schema contains information about the names and types of the columns of a table. 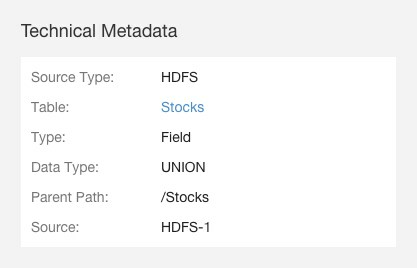 A Kite dataset ingested into HDFS contains information about the names and types of the fields in an HDFS Avro or Parquet file used to create the dataset. Use the Cloudera Navigator console to search for entities of source type Hive and type Table. In the list of results, click a result entry. The table schema displays in the Details tab. 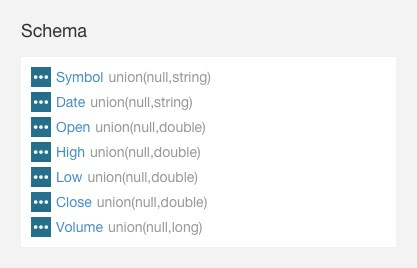 Use the Cloudera Navigator console to search for entities of source type Pig. In the list of results, click a result entry of type Table. The table schema displays in the Details tab. Warning: As of CDH 6.0.0, the Kite Dataset API is deprecated, and will be removed in a future release. For more information, see Deprecated Items. 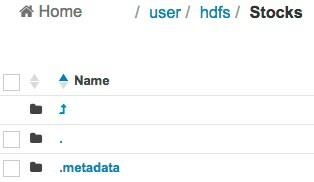 If you ingest a Kite dataset into HDFS, you can view the schema of the dataset. The schema is represented as an entity of type Dataset and is implemented as an HDFS directory. For Avro datasets, primitive types such as null, string, int, and so on, are not separate entities. For example, if you have a record type with a field A that's a record type and a field B that's a string, the subfields of A become entities themselves, but B has no children. Another example would be if you had a union of null, string, map, array, and record types; the union has 3 children - the map, array, and record subtypes. Use the Cloudera Navigator console to search for specific Dataset. Click a result entry. The dataset schema displays in the Details tab. "doc" : "Type inferred from 'AAIT'"
"doc" : "Type inferred from '28-Oct-2014'"
"doc" : "Type inferred from '33.1'"
"doc" : "Type inferred from '33.13'"
"doc" : "Type inferred from '400'"
Click the Stocks link. The schema displays at the right of the Details tab. Each subfield of the Stocks record is an entity of type Field.